This is the kind of design nerdery that makes my week. It's a promotional poster from Gotham Books to drum up interest in Simon Garfield's upcoming book, Just My Type, due out next month. Just My Type is a book of stories about fonts. It examines how Helvetica and Comic Sans took over the world. It explains why we are still influenced by type choices made more than 500 years ago, and why the T in the Beatles logo is longer than the other letters. It profiles the great originators of type, from Baskerville to Zapf, as well as people like Neville Brody who threw out the rulebook. The book is about that pivotal moment when fonts left the world of Letraset and were loaded onto computers, and typefaces became something we realized we all have an opinion about. 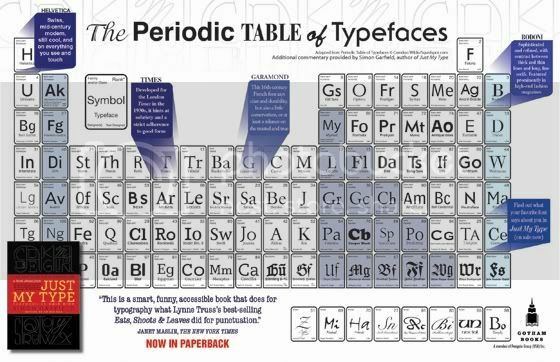 And beyond all this, the book reveals what may be the very best and worst fonts in the world – and what your choice of font says about you. Typefaces are now 560 years old. So when a Brit called Matthew Carter constructed the now-ubiquitous Verdana on his computer in the 1990s, what could he possibly be doing to an A and a B that had never been done before? And how did a friend of his make the typeface Gotham, which eased Barack Obama into the Presidency? And what exactly makes a font presidential or American, or British, French German, Swiss or Jewish? These are arcane mysteries and it is the job of the book to get to the heart of them. But it begins with a cautionary tale, a story of what happens when a typeface gets out of control. If that piques your interest, you can check out an excerpt on Garfield's site here.